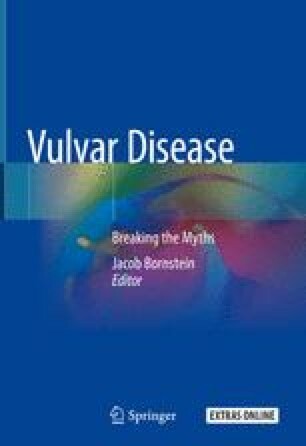 Vulvar cancer accounts for only 5% of all gynecologic cancers with an incidence rate of 2.4 per 100,000 women. The most common histological type of vulvar cancer is vulvar squamous cell carcinoma (VSCC). There are two different types of VSCC with their own associated premalignant lesions. The most common type occurs in elderly women and leads to mostly differentiated keratinizing VSCC in a background of lichen sclerosus and often differentiated vulvar intraepithelial neoplasia. The second type of VSCC consists of mainly nonkeratinizing carcinomas, primarily affecting younger women, and is associated with high-grade squamous intraepithelial lesions. The diagnosis VSCC should be confirmed histologically, preferably by a punch biopsy. The method of treatment for VSCC depends on the extent of the disease. In general, surgery is the first choice of treatment in patients with primary VSCC. The inguinofemoral lymph node status at initial diagnosis reflected in stage is of critical prognostic importance for patients with VSCC. The treatment of VSCC consists of radical local excision of the tumor combined with the sentinel node procedure in patients with early-stage unifocal tumors of less than 4 cm and without clinically suspicious groin lymph nodes. In case of a metastatic sentinel node, a larger or multifocal tumor, or clinically suspicious lymph nodes, an inguinofemoral lymphadenectomy is indicated. There is a limited role for primary radio- and/or chemotherapy. Overall survival for early-stage VSCC patients is good with 75% at 5 years. Howlader N, Noone A, Krapcho M, Garshell J, Miller D, Altekruse S. 2016. SEER cancer statistics review, 1975–2012. [Online]. Available: http://seer.cancer.gov/csr/1975_2012.